Makeup Artist Competition - Face Off! I'm super excited about the NY Fall Fashion Week 2010 season, begining in just a few weeks. As part of the Fashion Week's activities, I'll be covering several beauty-related events for New York's Fashion Night Out on Friday Sept. 10th, 2010. Since I'm a lover of all things beauty related, you know that I adore makeup artists and marvel at what they can do with the human face. 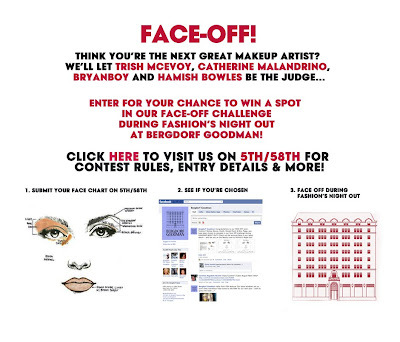 So I hope that all my makeup artist readers enter the Face Off! competition at Bergdorf Goodman, which is part of FNO. They are looking for the next great makeup artist! For the first time ever, the legendary department store is dong a live event challenge where makeup artists will create a makeup look on a model before a panel of judges. Among the distinguished judges will be none other than famed makeup artist Trish McEvoy and one of my favorite fashion desingers, Catherine Malandrino, who will help in picking the final winner! Apply Here! --> Face Off! Good information. Thanks. Anyways i am waiting for September.